Are we missing the smoke for the flame? Iconic movie legends of the 1940s and 50s were the trend setters of their day. In a time when the world was shrugging off the vestiges of war, a well-tailored pencil skirt and a pair of killer heels spoke volumes. These icons influenced with impunity; a testament that women would be reckoned with. A particular shade of lipstick against the filter of a cigarette, could, without words, signify an embodiment of glamour and elegance. Male colleagues, perceived as strong, powerful, and verbose, portrayed gangsters, gun slingers, or figureheads of Mafioso power while using profound screen moments to punctuate a message from behind a plume of blue grey smoke. The Marlboro cigarette company filled enormous billboards all across America extolling this ideology: ‘Where there is a man, there is a Marlboro’ screaming a subliminal message to those who were not carrying a Zippo. Time, and the intervention of modern science, brought medical reality, and by the 1990s a global message around the dangers of smoking, was hard to ignore. 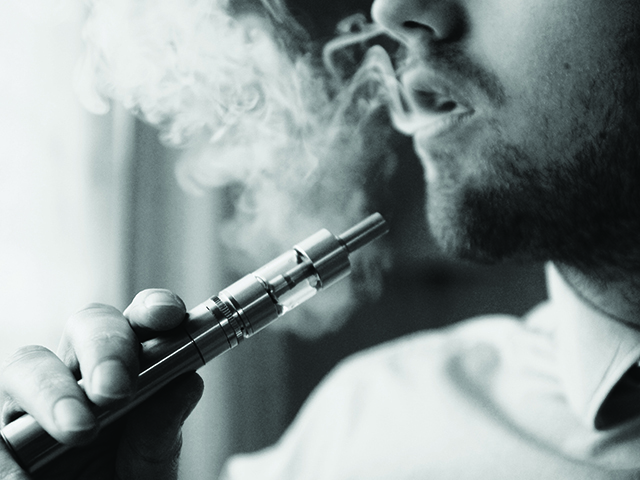 This week, the Health Information and Quality Authority (HIQA) released a report acknowledging E-cigarettes go some way to helping those addicted to nicotine. The author of the report, HIQA’s Director of Health Technology Assessment, Dr Máirín Ryan, said that their analysis examines the safety, effectiveness, and cost-effectiveness of all smoking cessation interventions available in Ireland which can be used to help smokers, quit for good. Global cigarette consumption still exists and in some countries there seems little to suggest that those smokers have taken any heed of the medical advice which incants; don’t smoke. Latest data on consumption dates from 2015, and suggests 1.3 billion people worldwide smoke filter cigarettes, with 15 billion cigarettes sold daily across the globe. E-Cigarettes were seen as a novelty product when they were created by a Chinese chemist in 2003, however, by 2008 they were being marketed across the USA. In the current form of personal vaporizer devices, they are commonplace only since 2014. Anecdotal evidence suggests that parents of teenagers worry that the trend of vaping may entice younger people to try it out. The HIQA report did not carry out a detailed review of the available data on factors affecting E-cigarette uptake among young people, but highlights: “Concerns that have been expressed in relation to a possible increase in the uptake of vaping among newer-smokers.” Dr Ryan said. Nicotine replacement therapy (NRT) includes gum, patches, inhalers, intranasal and oral sprays. Varenicline (is a prescription-only medication which helps people to stop smoking by reducing withdrawal symptoms) was found to be the most effective single pharmacotherapy; more than two and half times as effective as placebo. A budget impact analysis found that maximising the use of a combination of Varenicline and NRT would be associated with an increase of approximately €7 million in the annual cost of providing smoking cessation interventions in Ireland. The scope of the report didn’t look at enforcement of regulations on the sale, supply or marketing of e-cigarettes: “Rather, the HTA focused on the use of e-cigarettes as a smoking cessation treatment for adult smokers who want to quit.” Dr Ryan said. Denise Gerathy was a profound smoker. Before scientists connected nicotine, tar, and carcinogens with diseases that kill and cause long term health deterioration, smoking cigarettes was just a thing. With health awareness there was a surety that products proclaiming to help quit, such as patches, gum, and E-cigarettes, would be marketed, however, the lack of any conclusive evidence on how E-cigarettes impact on health must surely be considered. E-cigarettes are not licensed as a medical product in Ireland so they are not subject to the same level of regulation as NRT and prescription medicines, unlike the FDA regulations in America. The Public Health England report suggests that E-cigarette use is around 95 per cent safer than smoking, it remains valid as the current best estimate based on the peer-reviewed literature. Some flavourings and constituents in e-cigarettes may pose risks over the long term, the 5 per cent residual risk is a cautious estimate allowing for uncertainty. It’s difficult to imagine a Gossip Girl toking a Vape on screen; or that it could seem elegant, but stranger things have happened.